Microwaves are actually a segment of the electromagnetic wave spectrum, which comprises forms of energy that move through space, generated by the interaction of electric and magnetic fields. The spectrum is commonly broken into subgroups determined by the different wavelengths (or frequencies) and emission, transmission, and absorption behaviors of various types of waves. From longest to shortest wavelengths, the spectrum includes electric and radio waves, microwaves, infrared (heat) radiation, visible light, ultraviolet radiation, X-rays, gamma rays, and electromagnetic cosmic rays. Microwaves have frequencies between approximately .11 and 1.2 inches (0.3 and 30 centimeters). Microwaves themselves are used in many different applications such as telecommunication products, radar detectors, wood curing and drying, and medical treatment of certain diseases. However, certain of their properties render them ideal for cooking, by far the most common use of microwave energy. Microwaves can pass through plastic, glass, and paper materials; metal surfaces reflect them, and foods (especially liquids) absorb them. A meal placed in a conventional oven is heated from the outside in, as it slowly absorbs the surrounding air that the oven has warmed. Microwaves, on the other hand, heat food much more quickly because they penetrate all layers simultaneously. Inside a piece of food or a container filled with liquid, the microwaves agitate molecules, thereby heating the substance. The ability of microwave energy to cook food was discovered in the 1940s by Dr. Percy Spencer, who had conducted research on radar vacuum tubes for the military during World War II. Spencer's experiments revealed that, when confined to a metal enclosure, high-frequency radio waves penetrate and excite certain type of molecules, such as those found in food. Just powerful enough to cook the food, the microwaves are not strong enough to alter its molecular or genetic structure or to make it radioactive. Raytheon, the company for which Dr. Spencer was conducting this research, patented the technology and soon developed microwave ovens capable of cooking large quantities of food. Because manufacturing costs rendered them too expensive for most consumers, these early ovens were used primarily by hospitals and hotels that could more easily afford the $3,000 investment they represented. By the late 1970s, however, many companies had developed microwave ovens for home use, and the cost had begun to come down. Today, microwaves are a standard household appliance, available in a broad range of designs and with a host of convenient features: rotating plates for more consistent cooking; digital timers; autoprogramming capabilities; and adjustable levels of cooking power that enable defrosting, browning, and warming, among other functions. The oven cavity and door are made using metal-forming techniques and then painted using electro-deposition, in which electric current is used to apply the paint. 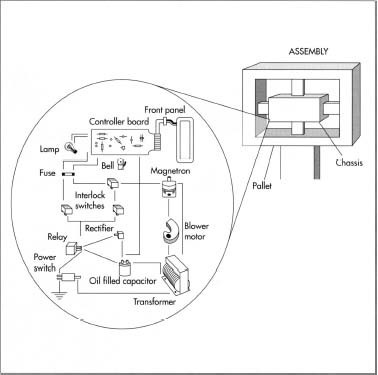 The magnetron tube subassembly includes several important parts. A powerful magnet is placed around the anode to provide the magnetic field in which the microwaves will be generated, while a thermal protector is mounted directly on the magnetron to prevent damage to the tube from overheating. An antenna enclosed in a glass tube is mounted on top of the anode, and the air within the tube is pumped out to create a vacuum. Also, a blower motor used to cool the metal fins of the magnetron is attached directly to the tube. door frame has a small window to enable the cook to view the food while it is cooking. Near the top of the steel oven cavity is a magnetron—an electronic tube that produces high-frequency microwave oscillations—which generates the microwaves. The microwaves are funneled through a metal waveguide and into a stirrer fan, also positioned near the top of the cavity. The fan distributes the microwaves evenly within the oven. Manufacturers vary the means by which they disburse microwaves to achieve uniform cooking patterns: some use dual stirrer fans located on opposite walls to direct microwaves to the cavity, while others use entry ports at the bottom of the cavity, allowing microwaves to enter from both the top and bottom. In addition, many ovens rotate food on a turntable. The cover or outer case of the microwave oven is usually a one-piece, wrap-around metal enclosure. The oven's inside panels and doors are made of galvanized or stainless steel and are given a coating of acrylic enamel, usually light in color to offer good visibility. The cooking surface is generally made of ceramic or glass. Inside the oven, electromechanical components and controls consist of timer motors, switches, and relays. Also inside the oven are the magnetron tube, the waveguide, and the stirrer fan, all made of metal. The hardware that links the various components consists of a variety of metal and plastic parts such as gears, pulleys, belts, nuts, screws, washers, and cables. 1 The process of manufacturing a microwave oven starts with the cavity and the door. First, the frame is formed using automatic metal-forming presses that make about 12 to 15 parts per minute. The frame is then rinsed in alkaline cleaner to get rid of any dirt or oil and further rinsed with water to get rid of the alkaline solution. 2 Next, each part is treated with zinc phosphate, which prepares it for electro-deposition. Electro-deposition consists of immersing the parts in a paint tank at 200 volts for 2.5 minutes. The resulting coating is about 1.5 mils thick. The parts are then moved through a paint bake operation where the paint is cured at 300 degrees Fahrenheit (149 degrees Celsius) for 20 minutes. The chassis or frame is mounted in a pallet for the main assembly operation. A pallet is a vise-like device used in conjunction with other tools. 3 After the door has been painted, a perforated metal plate is attached to its window aperture. The plate reflects microwaves but allows light to enter the cavity (the door will not be attached to the cavity until later, when the chassis is assembled). 4 The magnetron tube assembly consists of a cathode cylinder, a filament heater, a metal anode, and an antenna. 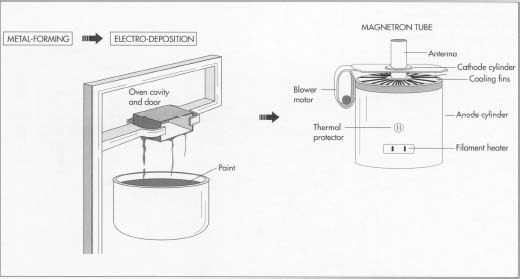 The filament is attached to the cathode, and the cathode is enclosed in the anode cylinder; this cell will provide the electricity that will help to generate the microwaves. Metal cooling fins are welded to the anode cylinder, and a powerful magnet is placed around the anode to provide the magnetic field in which the microwaves will be generated. A metal strap holds the complete assembly together. A thermal protector is mounted directly on the magnetron to prevent damage to the tube from overheating. 5 An antenna enclosed in a glass tube is mounted on top of the anode, and the air within the tube is pumped out to create a vacuum. The waveguide is connected to the magnetron on top of the protruding antenna, while a blower motor used to cool the metal fins of the magnetron is attached directly to the tube. Finally, a plastic fan is attached to the motor, where it will draw air from outside the oven and direct it towards the vanes. This completes the magnetron subassembly. 6 The chassis assembly work is performed on a pallet—a work-holding device used in conjunction with other tools—located at the station. First, the main chassis is placed on the pallet, and the cavity is screwed on to the chassis. Next, the door is attached to the cavity and chassis by means of hinges. The magnetron tube is then bolted to the side of the cavity and the main chassis. 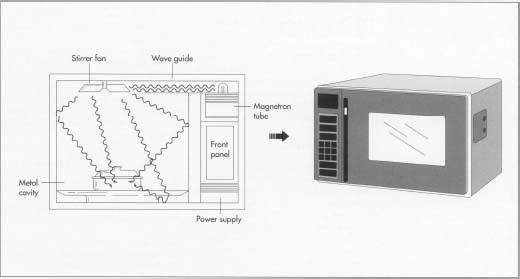 In a completed microwave oven, the magnetron tube creates the microwaves, and the waveguide directs them to the stirrer fan. In turn, this fan points the waves into the oven cavity where they heat the food inside. 7 The circuit that produces the voltage required to operate the magnetron tube consists of a large transformer, an oil-based capacitor, and a high voltage rectifier. All of these components are mounted directly on the chassis, close to the magnetron tube. 8 The stirrer fan used to circulate the microwaves is mounted on top of the cavity. Some manufacturers use a pulley to drive the fan from the magnetron blower motor; others use a separate stirrer motor attached directly to the fan. Once the stirrer fan is attached, a stirrer shield is screwed on top of the fan assembly. The shield prevents dirt and grease from entering the waveguide, where they could produce arcing and damage the magnetron. 9 The cook switch provides power to the transformer by energizing a relay and a timer. The relay is mounted close to the power transformer, while the timer is mounted on the control board. The defrost switch works like the cook switch, activating a motor and timer to operate the defrost cycle. Also mounted on the control board are a timer bell that rings when the cooking cycle is complete and a light switch that allows viewing of the cavity. A number of interlocking switches are mounted near the top and bottom of the door area. The interlocking switches are sometimes grouped together with a safety switch that monitors the other switches and provides protection if the door accidently opens during oven operation. 10 A front panel that allows the operator to select the various settings and features available for cooking is attached to the chassis. Behind the front panel, the control circuit board is attached. The board, which controls the various programmed operations in their proper sequence when the switches are pushed on the front panel, is connected to the various components and the front panel by means of plug-in sockets and cables. 11 The outer case of the microwave is made of metal and is assembled on a roll former. The case is slipped onto the preassembled microwave oven and bolted to the main chassis. 12 The power cords and dial knobs are now attached to the oven, and it is sent for automatic testing. Most manufacturers run the oven from 50-100 hours continuously as part of the testing process. After testing is complete, a palletizer robot records the model and serial data of the oven for inventory purposes, and the oven is sent for packaging. This completes the manufacturing process. Extensive quality control during the manufacture of microwave ovens is essential, because microwave ovens emit radiation that can burn anyone exposed at high levels for prolonged periods. Federal regulations, applied to all ovens made after October 1971, limit the amount of radiation that can leak from an oven to 5 milliwatts of radiation per square centimeter at approximately 2 inches from the oven surface. The regulations also require all ovens to have two independent, interlocking switches to stop the production of microwaves the moment the latch is released or the door is opened. In addition, a computer controlled scanner is used to measure emission leaks around the door, window, and back of the oven. Other scanners check the seating of the magnetron tube and antenna radiation. Each scanner operation relays data to the next-on-line operation so that any problems can be corrected. Because of their speed and convenience, microwave ovens have become an indispensable part of modern kitchens. Many developments in the microwave market and allied industries are taking place fairly rapidly. For example, foods and utensils designed specially for microwave cooking have become a huge business. New features will also be introduced in microwaves themselves, including computerized storage of recipes that the consumer will be able to recall at the touch of a button. The display and programmability of the ovens will also be improved, and combination ovens capable of cooking with microwaves as well as by conventional methods will become a standard household product. Davidson, Homer L. Microwave Oven Repair, 2nd edition. Tab Books Inc., 1991. Gallawa, J. Carlton. The Complete Microwave Oven Service Handbook: Operation, Maintenance. Prentice Hall, 1989. Microwave Oven Radiation. U.S. department of Health and Human Services, 1986. Pickett, Amold and John Ketterer. Household Equipment in Residential Design. John Wiley and Sons, 1986. Raytheon Company. Appliance Manufacturer. Cahners Publishing, 1985. Klenck, Thomas. "How It Works: Microwave Oven." Popular Mechanics. September, 1989, p. 78. Roman, Mark. "The Little Waves That Could." Discover. November, 1989, p. 54. Great article, it would be usefull to add a section about recycling the parts, be it into other devices, or recycling plants. Seeing as our landfills aren't shrinking, and dismantling a microwave (i.e. components from sheet metal) can be done in 15 minutes (give or take). Its my hope that moving forward society will think more about disposal before they purchase, household appliances. I actually collect the magnetrons, H.V.Caps, xformers, and Display units for other projects that I'm currently working on. All the rest of the materials get recycled, including any precious metals found. Its a great article. I have collected the information about design and The Manufacturing Process of microwave oven. It would be good for the student if you add the information about 'ROLL OF WAVEGUIDE IN MICROWAVE OVEN'. I AM CURRENTLY WORKING ON THE PROJECT RELATED TO MICROWAVE OVEN. pls i need your assistance concerning my project with the topic ;development and testing of continuous microwave bio diesel.that is how to design or construct a microwave that uses bio diesel. i will be looking forward to hearing from you.